While 750 square feet may not seem like a lot of space, prominent interior designer and Arc Jacksonville board member, R. Ward Lariscy has proven that it’s the perfect amount. That’s the size of each of the 97 affordable apartments at The Arc Jacksonville Village, where adults with intellectual and developmental disabilities will live independently. The apartments feature individual bedrooms and bathrooms and a shared kitchen and living room. Three apartments, one two-bedroom and two one-bedrooms, serve as model units. Sticking to a budget of approximately $2,500 per unit, Ward completely furnished and decorated each apartment, transforming them into unique living spaces with a distinct personality. To stay within budget and to show that a little can make a big impact, Ward visited resale shops, discount stores, outlets and major retail chains throughout Jacksonville. Each unit features a different theme, which took shape once a major piece, such as a sofa, was found. Accent pieces and décor items were then selected to perfect the look. 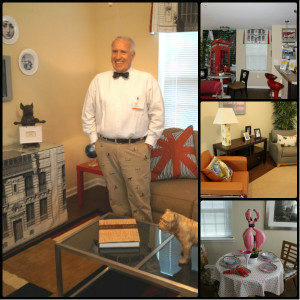 Ward’s favorite apartment became the British-themed model home. “It reminded me of all the years I used to travel to England to buy antiques for my business and clients,” he said. “It was not my usual decorating project, but it was rewarding!” Ward said. The smiling faces of future residents and compliments from all who have visited the models, Ward explained, were his most meaningful compensation. Ward’s involvement didn’t stop, or begin, there. Ward was instrumental in decorating the community center, the hub of The Arc Jacksonville Village. At the community center residents check their mail, access the internet, pay rent, watch movies, eat dinner, participate in activities and much more. Decorated with bright colors, eye-catching artwork, modern furniture and interesting accents, Ward created a vibrant, inviting environment for residents, staff and volunteers.